The radio manufacturer, Melson, caught my attention a couple of years ago when it released the Melson M7–an AM/FM radio with a built-in MicroSD MP3 player. It wasn’t that an AM/FM/MP3 combo radio was that unique or novel, rather, what impressed me most was that the M7 delivered unexpectedly robust audio from its built-in speaker. I purchased an M7 last year and found that the little portable could easily fill the average-sized room with clear, rich audio, a truly superlative feature. Other than its audio, however, the radio was fairly standard. My Melson M7 had good AM (medium wave) and FM sensitivity–well, at least on par with most other DSP portables in its price range. While the built-in MP3 player was basic, it was simple to use and functional. I loaded it with a MicroSD card filled with music and recordings, and put it to use as a mini-juke box of sorts. I didn’t expect more from that radio, or from its line. But when I discovered that the newest portable in the Melson line, the Melson S8, could receive shortwave radio, I ordered one immediately. 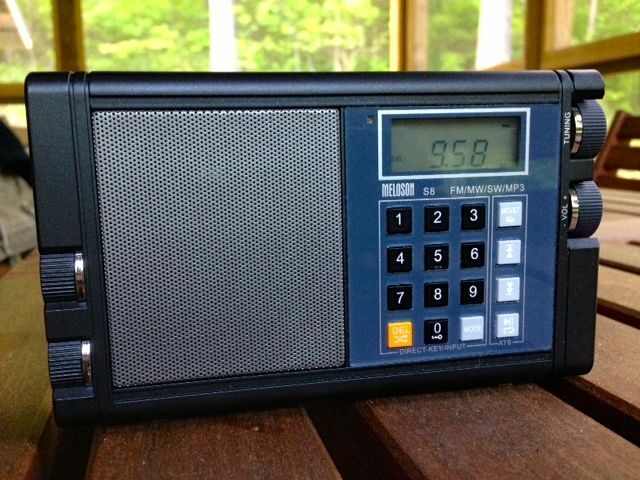 This time, I didn’t have the radio in mind for personal use; I hoped it might serve our non-profit, Ears To Our World. At ETOW, we take information-delivery devices into parts of the world that currently lack access to the Internet. Shortwave radio is our usual medium, and most recently, we’ve put into service pre-recorded content loaded onto MicroSD cards–a simple way to give school children months of educational and musical programming. I had hoped the S8 might just support this need. The Melson S8 resembles its sibling, the Melson M7, in every respect–down to the quirky “faux knobs” on the left side of the radio. Overall, the chassis feels sturdy and the buttons have a tactile response, with enough resistance to keep them from becoming accidentally pressed when, for example, the radio is packed in a suitcase. For shortwave and FM listening, the built-in antenna is rather short but sturdy. Fortunately, the S8 also sports that amazing speaker found in the M7–a speaker that uses an acoustic chamber to achieve excellent audio. Since the S8 also has an AUX-in jack, it can be plugged into a laptop’s headphone jack, reinventing the S8 as an amplified portable speaker. The S8 has a small digital display with backlighting that turns on or off depending upon the lighting level. For example, if it’s outside in the sun, the photosensor will turn off the blue backlighting. The controls are on the right side of the radio: the tuning knob, volume control, power button, MicroSD card slot, DC power input (mini USB), headphone jack, and AUX-in. Both the tuning and volume knobs work smoothly, but don’t feel quite as sturdy as I would like. I’m not sure how well they would hold up to years of daily use. When turning the tuning knob, the action is not seamless; you’ll detect slight incremental “bumps” or pauses that coincide with the receiver’s tuning steps on any given band. The volume control, however, is smooth, much as one would expect of a traditional analog radio. The S8 utilizes the new slim rechargeable battery pack found in some Degen and Grundig models. While I’m not a great fan of these battery packs, they do seem to perform reasonably well and allow for a thinner radio. When you first power up the Melson S8, if you have a MicroSD card inserted, it defaults to the MP3 playback mode and will begin playing the first MP3 on your card. You must press the light grey MODE button to cycle through the bands. The order is as follows: MP3 -> FM -> AM/MW -> SW1 -> SW2. I find this a bit annoying, since I’m primarily interested in the shortwave bands, thus must cycle through all the other modes before arriving at my selection. When powering up, I do wish Melson permitted the radio to default to the last mode used, a standard practice among portables. 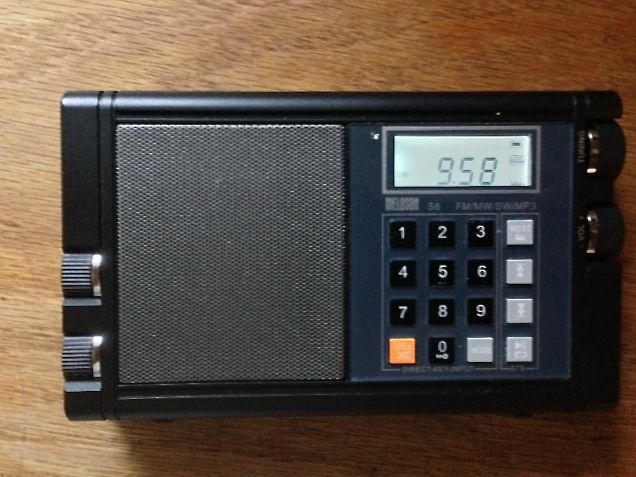 Like the Melson M7, the Melson S8 has good AM (medium wave) and excellent FM sensitivity. If these are the two bands you listen to most, then you will be pleased with the excellent audio the S8 will deliver via its built-in speaker. On shortwave, however, I’m disappointed by this radio. Most of the DSP radios I’ve tested have reasonable shortwave sensitivity and selectivity; I had hoped for the same from the S8. Unfortunately, the S8 generates internal noise that pollutes shortwave listening. While the noise is present on most bands, I find that it’s most pronounced on the popular 31 meter band. There is the possibility that this noise might be specific to my particular unit. I spoke with a friend who didn’t notice the noise on his S8, but he lives in an area with a lot of RFI, which may have obscured the unit noise. So while I recognize that this might be a defect in my radio, I’m not interested enough in the S8 to order another for comparison. However, I would be curious if any SWLing Post readers have noticed this, and welcome your observations. Note that the static crashes you hear in the recording are not due to performance shortcomings of either radio, but due to regional storms on the date of my recordings. I’m sure you’ll note the number of cons in this list. As a result, I could not recommend purchasing the Melson S8, especially if you’re seeking a good shortwave receiver. There are many other radios in the same price range which offer excellent shortwave reception. I would suggest the Tecsun PL-380 or Tecsun PL-310ET, instead. 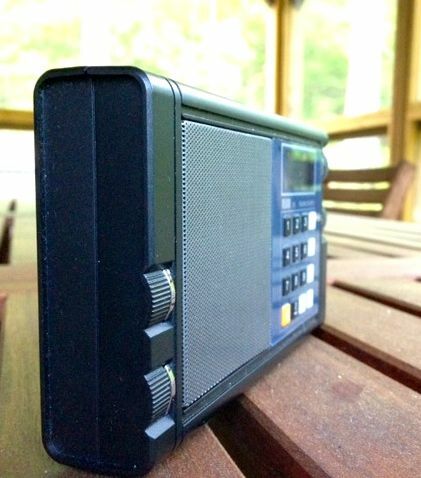 If, however, you’re looking for a portable AM/FM radio with a built-in MP3 player, you may be pleased with the S8. And as I suggested, I’ve also found the S8 useful in a pinch as a laptop speaker. 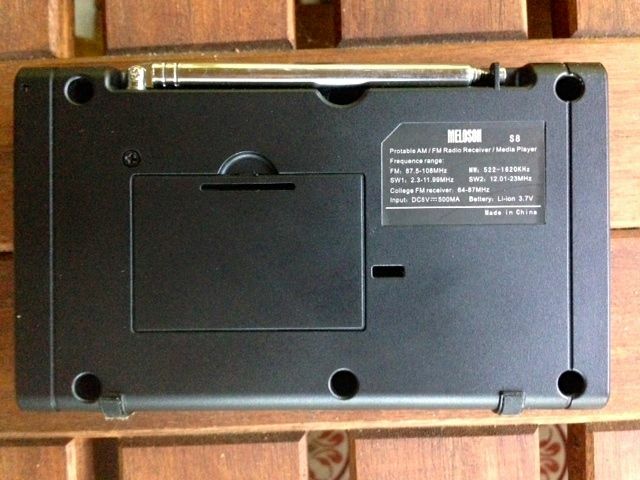 But if you already have a Melson M7, do keep it. It’s a good radio, and functions well for what it does. I feel like the Melson S8 is an “upgrade” that its engineers never actually tested. If they had, they would certainly hear the high noise floor on the S8 and realize that this radio can only detect the strongest of stations. I purchased my Melson S8 on Amazon, where the Melson M7 is also sold. This entry was posted in News, Radios, Reviews and tagged Melson, Melson M7, Melson M8, Melson S8, Melson S8 Review, Reviews, S8, Shortwave Radio Reviews on May 15, 2014 by Thomas. I wanted a small MP3 with good audio, AM/FM and SW, and the S8 fit the bill, so I bought one. In evaluating the somewhat dismal SW performance, I took off the stock 17″ antenna, and substituted a 35″ whip just for experimentation. It made a huge difference in reception on SW to the point the modified S8 is on a par with my Kaito KA-1121. Unfortunately the antenna does not store well as it sticks out from the radio body for several inches, so I have reinstalled the stock whip antenna and now rely on a clip on reel type antenna. I also tuned to Radio Australia on 9580, and my signal sounded exactly like the sample audio recording provided in the review. It sounds like some kind of tone, and is pronounced in the 31 meter band, and disappears not too much above or below that. This is unfortunate as the sensitivity of the SW is best on 31 meters. So, if you are going to back pack with this radio, I would recommend either taking along a whip extender, or a roll up long wire to clip on to the whip. Another note, the metal on the antenna is very soft and not swaged down too well, so it is easy to pull the antenna out of the radio if you are not careful. I would recommend you disengage the antenna from the body of the radio, and rotate it out 45 to 90 degrees, then fully extend the antenna. In this way you are extending the antenna at right angles to the radio and won’t accidentally pull it out of the radio. The digits display on the S8 for shortwave is also a little goofy, with the first 3 digits displayed for a 4 digit frequency, and 4 digits for a 5 digit frequency. The exception to this occurs when the last digit is a “5”. Then, the “5” will be displayed at half size. It t means you have to count clicks of the tuning wheel to get exactly on frequency. 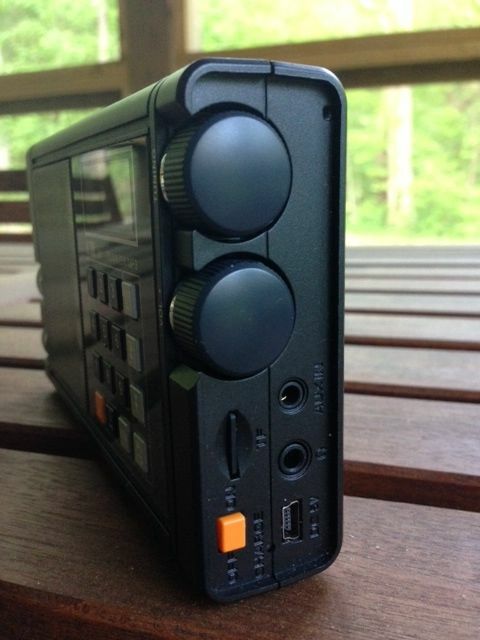 Can any of you readers advise where I can purchase an Anjan DTS 10 radio. I have been told that it is not produced anymore. I really like my Meloson S8. It is NOT a fantastic radio, but not a terrible one either. Certainly much better than the horrible DE321 that I wish I never bought. What’s great about the S8 is that it can be a great portable MP3 player. The functions and display are mediocre for sure, but if you happen to have a folder full of hundreds, or thousands, of songs you’d like to shuffle, this will give you days of random musical enjoyment. Other recent radio/MP3 players from China which you would think might be good shuffle machines, like the Tecsun PL-398MP and the Tecsun ICR-110 do NOT play MP3 files randomly. I have a few micro SD cards packed with music specifically to play in my S8, which makes this it a very valuable device on any vacation or weekend trip. The speaker sounds warm and clear and it’s a small thing. If you don’t mind mono, the music is treated nicely by this gadget. The radio is just a bonus. No DX machine, just a practical way to tune in the stations you expect to find wherever you might be. Although it uses the same type of chip you find in the Tecsun ultralights, this radio is not in the same league. I have not noticed the chirping sound with headphones, as I would have no reason to listen to this particular player/radio with headphones. It’s the speaker that makes this radio valuable. I have better radios and players to use if headphones are gong to be involved. And I haven’t noticed appreciable noise on HF bands, but again I don’t regard this as a DX machine in any sense. MW isn’t bad and it picks up Cuba and all the ridiculous American Christian SW stations just fine. Amazon does not appear to have the M7 any more. I think it’s now the M8, don’t know what the model designation means in terms of improvements. Also, when I ordered my M8 it was labeled Tesslor instead of Meloson. Seems to be the same radio, though. Amazon no longer lists the M7, but Kaito USA still does. The only good thing about the Meloson family (M7 and M8) is the sound, very nice despite its small form factor..otherwise is a very basic radio with a primitive display, seems to be a prototype…and the B5CL battery is very week, need to recharge it after 4 hours of moderate use. Would like to see more “real radios” with that kind of sound, like the PL880 from Tecsun..most portables SW radios sound so bad.. I don’t know how to post a picture in the comments, otherwise I’d show you my S8 posing in front of his uncle, the Grundig Satellit 500. Then you’d know why they put them there. Faux knobs? That can’t be a good sign.